Snow on the ground used to mean an end to outdoor riding for cyclists. But the ever-growing popularity of fat bikes lets you ride year-round. At the ranch, fat biking gives you another way to enjoy our daily groomed Nordic trails, sections of which are dedicated to fat biking. This White Season we’ve got even more fat bikes to rent for half-day or full-day usage. You can also explore fat biking throughout the region with our partner Teton Mountain Bike Tours. Fat bikes generally look like mountain bikes, but get the name from the wide tires equipped to each bike. 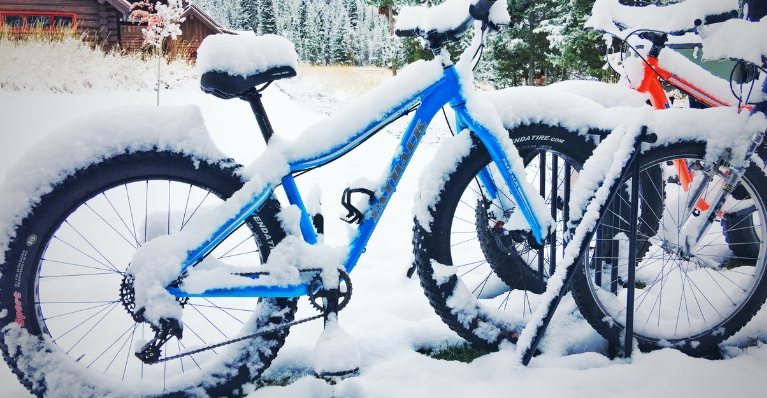 The tires are between 4 inches and 5 inches wide and float on the surface unlike what you experience with a traditional mountain, cross or road bike that would sink into the snow. The tires run at incredibly low air pressure – 5 to 8 psi compared to 25-35 psi you’d typically ride on a mountain bike. We recommend dressing like you would for cross country skiing – in layers. Pay special attention to keeping your head, feet and hands warm. You’ll also want a light backpack, extra water, glasses or goggles, a camera and lip balm. Like cross country skiing, fat biking provides a great winter work out. You can burn up to 1,500 calories an hour in soft snow. You’ll recover faster than if you went on a run because it’s not a weigh bearing activity. It will also give your core a good workout and help improve your balance. Perhaps the easiest part about riding at our ranch is that the trail is right outside your cabin door! Step outside and you’ll be quickly pedaling along sections of our 15 km of trails that are dedicated to fat biking. You’ll see amazing views of the Grand Tetons and likely come across the winter wildlife that abounds near the ranch. Once you’ve exhausted yourself, you can retreat to the lodge and refuel with a hearty lunch or dinner and warm yourself in front of the fireplace with a hot toddy. The entire experience will leave you with a completely different perspective on what bike riding during the winter means.